- support the people who start the private import business with health care products. - support the people who continue the private import business more smoothly. If you start business with us, you easily realize the import business without any stocks. Our business is the system of Drop shipping for personal use which means that we receive the orders from importers and transfer it to our suppliers in India. Each of orders should be for personal basis with small quantities and after receiving them, suppliers make each package as personal mail (EMS/ RAM) and finish all procedure of shipping on the same day. As we receive the tracking and shipment numbers from suppliers after shipment, we send you them as the announcement of completion of arranged for shipping. Your clients (consumers) will receive the parcel from suppliers directly within 15days after their orders. As you receive the order request from consumers, each time they need you receive the order and transfer them to us. we gather all of orders from your clients and send the orders to our suppliers. 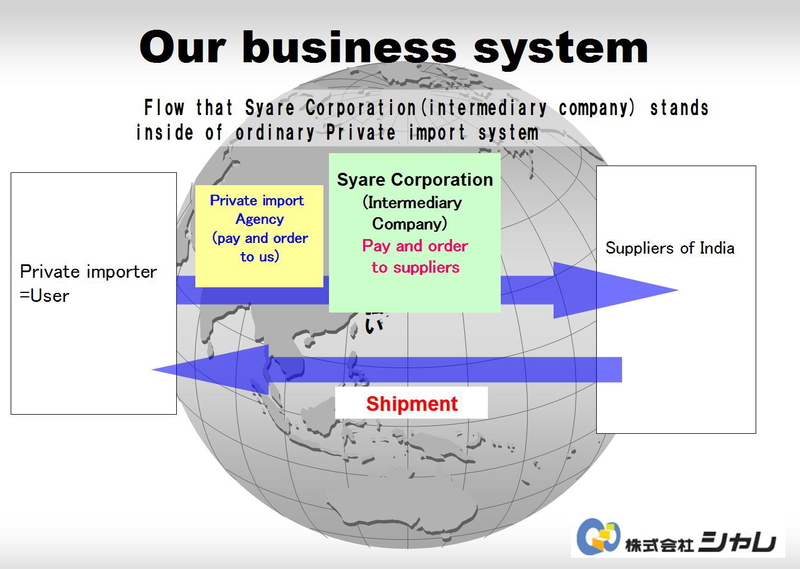 You can realize such a import business without keeping any stock your side. We make our customers happy by providing them with safe, reliable information on overseas products for their healthy and happy lives and arranging for them to place orders, and contribute to the community by paying taxes and training employees. In Japan, companies are considered to be public institutions and, for this reason, temporary borrowers of human resource, merchandise, capital, and information from the community. We not only make reasonable profits by offering service as a company but also contribute to the regional security, global environmental protection and infrastructure improvement including tree-planting and recycling by paying taxes to the local government. Furthermore, without devoting ourselves to only make profits, we volunteer to train our employees community-oriented. This is because training will lead to the development of the entire community. We train our employees people-oriented and community -oriented so that they can say thank you to each others and love each other. We collect safe and peaceful information from all over the world in order to make circumstances to support small and medium-sized enterprises, and contribute to the society by connecting "a circle of Thank you." As collecting valuable information from all over the world, we assist the performance improvement of small and medium-sized enterprises. We work on new things as a pioneer, and lead a standard of the industry. We provide quality information of the products given by reliable traders in the world. "101 percent of customer satisfaction"
We provide "an emotional movement" to our customers by sending satisfaction and +1 sincerity. We excavate needs and wants of small and medium-sized enterprises which pursue sociability. In order to realize their permanent development, we investigate the improvement thoroughly in both aspects of information quality and convenient service. We provide superior information to small and medium-sized enterprises so that they can create additional values. We serve for the people and the society, and we train loving persons who connect "thank you." 1. We provide information needed by our customers. 2. We provide the certified information regarding the safety of products. 3. We construct a business system which our customers can use conveniently. 4. We train a person who can arrange a management cycle. 5. We grow a company which is required by society. 6. We build a healthy company which contributes to the society by paying taxes. 7. We construct employee's wealth in both substantial and spiritual aspects. We focus on a possibility of human beings, challenge a dream and grab an emotional movement. Challenging is to show one's ability more than 100%. An emotional movement is to make a final result by showing one's ability more than 100%. 2. Think a great deal of daily pile. 3. Do usual matters closely. 4. Build tommorow's self by growing up today's self than yesterday's self. 5. Be considerate to others, and have a heart of gratitude. 6. Receive yourself, and receive others, too. 7. Obey the social order, and behave moderately. We collect exact information from all over the world, then provide information to small and medium-sized enterprises when required.